Xenia, Ohio, recruiter Sgt. 1st Class Paul Aroh talks to applicants about the enlistment process at MEPS. Though recruiting duty can be demanding, Aroh recently earned his Ph.D. in counseling with an impressive 4.0 GPA. 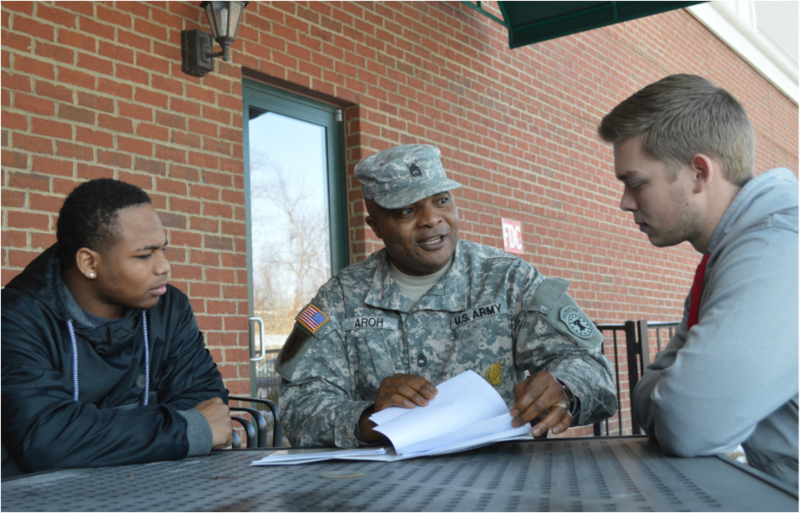 Earning a masters degree as an NCO can be a challenging task. But getting both a masters and a Ph.D. while on recruiting duty? That’s exactly what Columbus Battalion recruiter Sgt. 1st Class Paul Aroh recently accomplished. Aroh enrolled into a masters program while on active duty, but his studies were interrupted by several overseas deployments. In 2005, he transitioned to the Army Reserve becoming an AGR recruiter. Aroh continued his studies in human resources administration while attending the Recruiting and Retention school at Fort Jackson, and recruiting from the Baltimore battalion, eventually graduating 2008 with a 3.7 GPA. The memories of war continued to haunt Aroh after he returned from deployment. His struggle to put those memories behind him inspired Aroh to pursue a Ph.D. in counseling with the goal of helping other Soldiers facing similar challenges. When he transferred to Columbus Battalion in 2010, Aroh enrolled at Capella University eventually earning a doctorate in counseling with an impressive 4.0 GPA. “I wanted to put to use my experience and education by putting myself in a position someday where Soldiers or veterans can see themselves in me, can feel at home as a fellow comrade, and can share with me their deepest concerns in their transition process,” Aroh said. He believes providing veterans with the help and resources they need will help them survive challenges they may face in the civilian sector. Aroh was the top USAR recruiter in Baltimore five years in a row. He was promoted to Sgt. 1st Class, after eight years in service. He believes helping veterans is a way for him to give back to the Army.